From Pensacola Beach, Atmore, Jay, Bratt and surrounding areas, about 600 elementary school students attended the 17th annual Food for America program Friday morning at Northview High School. 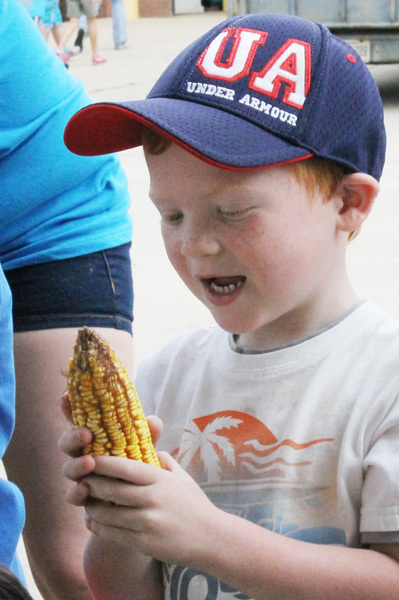 For a photo gallery from the event, click here. 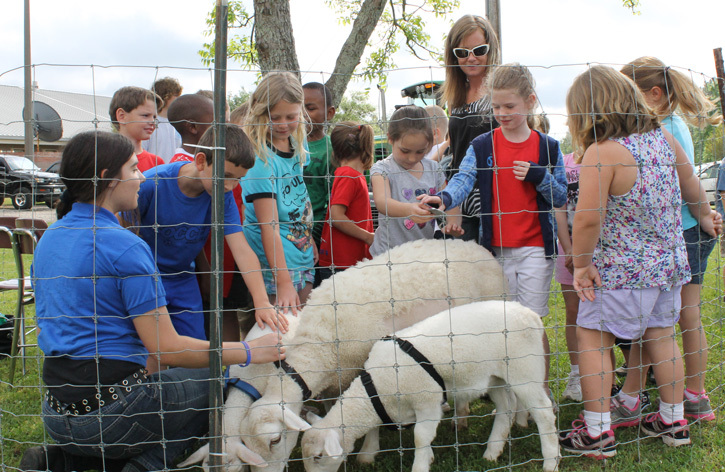 The program, sponsored the National FFA Organization and conducted by the Northview FFA, gave the students a chance to learn about agriculture firsthand as they got up close and personal with farm animals, farm equipment and more. The students even had the opportunity to make their own butter and enjoy it on crackers. Northview’s FFA has been recognized throughout the state for the innovative agricultural education program. The day was dedicated in memory of teacher and Northview FFA Advisor Tommy Weaver, who passed away recently. 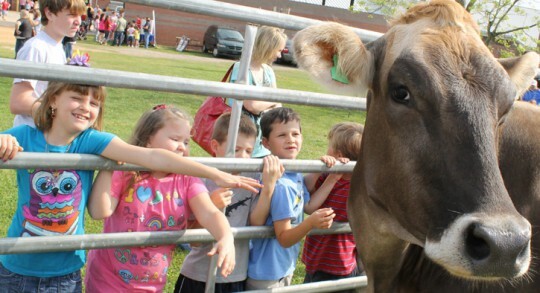 Pictured: Northview High School FFA’s Food for America program Friday morning. NorthEscambia.com photos, click to enlarge. Tonight: A 30 percent chance of showers and thunderstorms, mainly before 7pm. Patchy fog after 1am. Otherwise, partly cloudy, with a low around 60. South wind between 5 and 10 mph becoming calm. Sunday: A 20 percent chance of showers and thunderstorms after 1pm. Patchy fog before 9am. Otherwise, mostly sunny, with a high near 87. Calm wind becoming south between 10 and 15 mph. Sunday Night: Patchy dense fog after 1am. Otherwise, mostly clear, with a low around 60. South wind between 5 and 10 mph becoming calm. Monday: Patchy dense fog before 9am. Otherwise, mostly sunny, with a high near 87. Calm wind becoming south between 5 and 10 mph. Monday Night: Patchy fog after 1am. Otherwise, partly cloudy, with a low around 60. South wind between 5 and 10 mph becoming calm. Tuesday: A 30 percent chance of showers and thunderstorms. Partly sunny, with a high near 88. Calm wind becoming south around 5 mph. Tuesday Night: A 30 percent chance of showers and thunderstorms. Mostly cloudy, with a low around 61. South wind around 5 mph. Wednesday: A 40 percent chance of showers and thunderstorms. Partly sunny, with a high near 83. South wind around 5 mph. Wednesday Night: A 40 percent chance of showers and thunderstorms. Mostly cloudy, with a low around 62. Thursday: A 30 percent chance of showers and thunderstorms. Partly sunny, with a high near 82. Friday: A 20 percent chance of showers and thunderstorms. Partly sunny, with a high near 83. Police are investing an attempted kidnapping as a child walked to an elementary school in Escambia County Friday morning. It happened in Pensacola, but parents everywhere are being urged to take steps to make sure their children are safe. The child was walking to Scenic Heights Elementary when she said she was approached by a man in a green minivan who tried to give her a ride and offered her candy and toys. He then allegedly pulled out a long knife, prompting her to run away, according to police. The suspect was described as a black male, about 35-45 years old with a diamond earring, curly black hair and a beard on his chin. According to Pensacola Police, another child at the school admitted Friday that a similar incident had happened to her, with the man trying to lure the girl into his apartment. Trust your feelings, if someone makes you uncomfortable, get away and tell your parents or a trusted adult. Walk with a parent, friend or group. If someone offers you a ride, say no. If someone offers to take you somewhere, run away and yell. If you go home alone after school, call your parents and let them know you are OK when you arrive home. East Kingsfield Road will be closed at Highway 29 beginning next week. East Kingsfield will be closed from Highway 29 to Pompano Street. The closure is set to begin April 3 for an Escambia County road construction project. Contractor Roads, Inc. expects to re-open the roadway by April 13. The Escambia County Sheriff’s Office has arrested a second suspect in the murder of Fredric Ortiz in a neighborhood just off Highway 29. 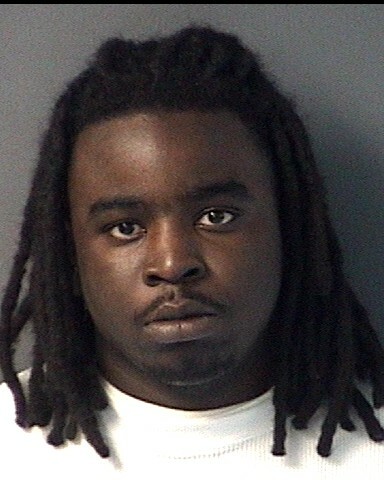 Rico Cordale Roberson was booked into the Escambia County Jail Friday for his involvement in the March 20 fatal shooting. Ortiz was found gunned down on Hayworth Avenue, just off Highway 29 near I-10. Roberson is being held on a $250,000 bond on one count of homicide. Roberson’s accomplice, Bryan Hines, was arrested last weekend at the Pensacola International Airport as he tried to use his pass card to get to work. Hines is being held at the Escambia County Jail under a $250,000 bond. A federal judge Friday sentenced woman to over six years in prison for the largest tax fraud case in Alabama history, a portion of which involved an Atmore storefront business. Alice Mobley was sentenced to 6 years and 3 months in federal prison by Chief U.S. District Judge William Steele. She will also forfeit $593,949.77 in cash and property seized from her home and business locations in March 2010, and she was ordered to pay $720,067 in restitution to the federal government. Mobley pleaded guilty in July to conspiracy, tax perjury, wire fraud and aggravated identity theft for orchestrating what was described as a systematic schedule to file thousands of false tax returns and defraud the government of hundreds of thousands of dollars. 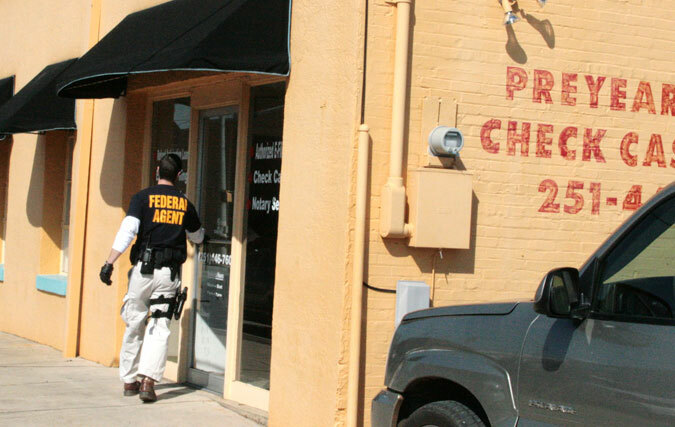 Federal agents raided Mobley’s Preyear’s Tax & Check Cashing, LLC on Ridgely Street in Atmore and other locations in March,2010. Federal court documents show that FBI and IRS agents seized over $300,000, boxes of tax documents, computers, vehicles and even a stuffed teddy bear when they raided the businesses and Mobley’s Monroeville home. Mobley’s scheme filed tax returns claiming some $68 million in tax refunds, largely for Earned Income Credit and other tax credits, according to the Department of Justice. Mobley would falsely claim various dependent credits, either charged her clients an extra fee for the using the false dependents or pocketing the extra funds herself. Mobley also “split” dependents, using the identity of some children on one return to obtain Earned Income Credit, and on other returns to obtain Child Credit and Dependent Care Credits. Mobley’s firm also prepared returns which claimed business tax deductions for business which did not exist and farm tax deductions for clients who did not have farms, the DOJ said. 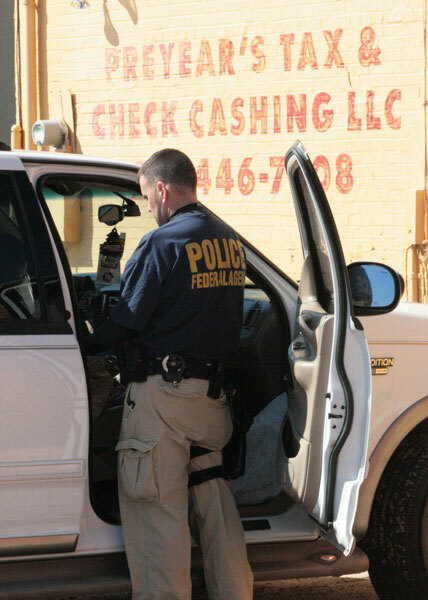 Pictured above: A federal agent enters Preyear’s Tax & Check Cashing, LLC in Atmore March 4, 2010. 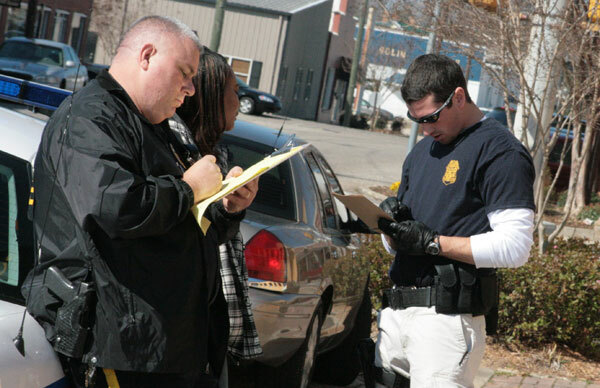 Pictured inset: Agents search a vehicle at the business. Pictured below: A federal agent and an Atmore Police officer talk to an employee of the business during the raid. NorthEscambia.com exclusive photos, click to enlarge. 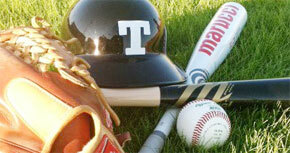 The Tate High School Aggies improved to 15-1 on the season Friday with a 6-5 win over Washington High School. The junior varsity Aggies also beat Washington, 10-6. The Aggies will travel to Escambia High Tuesday, April 3 with the varsity taking the field against the Gators at 7 p.m.
DUI charges are pending against a Pace man following a single vehicle wreck on Nine Mile Road Friday afternoon. According to the Florida Highway Patrol, 54-year old Frank Amore was eastbound on Nine Mile Road when he veered off the roadway striking a curb and a traffic road sign. He managed to maneuver his 2004 Dodge Ram back onto Nine Mile Road before hitting another curb and then colliding with a the business sign of “Net Strike Arena”. Amore was transported by ambulance to Sacred Heart Hospital with minor injuries. According to the FHP, DUI and other charges against Amore are pending the results of a blood test. The latest job numbers released Friday showed a little bit of good news in the three-county North Escambia area — while Florida’s state unemployment rate dropped to the lowest level since early 2009. Escambia County’s unemployment fell half a percentage point from 9.5 percent in January to 9.0 percent in February. There were 587 jobs gained during the period, for a total Escambia County unemployment of 12,254 people. One year ago, unemployment in Escambia County was 10.3 percent. 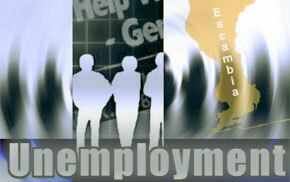 Santa Rosa County unemployment slipped from 9.0 percent in January to 8.6 percent in February. Santa Rosa County added 344 jobs during the period, with a total of 6,067 persons still unemployed. The year-ago unemployment rate in Santa Rosa County was 9.2 percent. In Escambia County, Alabama, unemployment dropped slightly from 9.6 percent in February to 9.5 percent in February. That represented 9 people returning to work during the month. There were 1,381 people unemployed in the county during the month. Florida’s unemployment rate dipped in February to 9.4 percent, the lowest since February 2009, the state labor agency reported Friday. The rate was 0.2 percentage points lower than in January, and nearly a point and a half lower than a year ago. The Department of Economic Opportunity said, however, there remained 869,000 people looking for work out of a state labor force of just under 9.3 million, and Florida’s rate remains well above the nation’s jobless rate of 8.3 percent. Alabama’s seasonally adjusted unemployment rate, at 7.6 percent in February, was down from January’s rate of 7.8 percent and was below the year-ago rate of 9.3 percent. The unemployment figures do not include discouraged workers who have given up on their job search or part-time employees who would rather be working full time. If those are added, the jobless rate typically climbs by several points. A cow, a dog and a woman caused traffic problems on Highway 29 just south of Barrineau Park Road late this morning. The woman was chasing a small dog that was chasing a cow into traffic about 11:40 a.m., forcing drivers to steer clear of them. 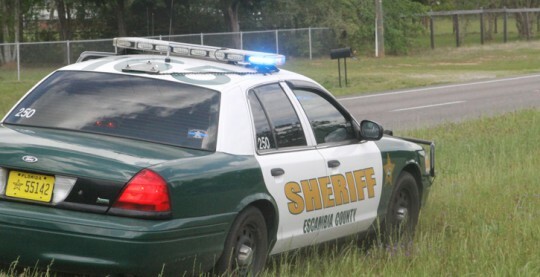 The woman, the dog and the cow were darting across all four lanes of Highway 29 as Escambia County Sheriff’s deputies and a Florida Highway Patrol trooper worked to stop traffic and corral the wayward trio. The woman eventually chased the dog — which was still chasing the cow — into a wooded area east of Highway 29. After the lady was able to catch the dog, she fell to ground overheated and with exhaustion. 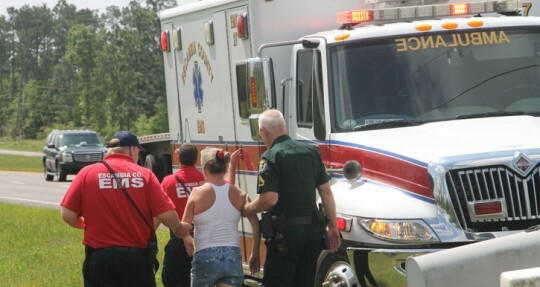 She was evaluated on scene by Escambia County EMS. The dog was returned to its owner. And after a period of freedom in the woods, deputies were able to put the cow back out to pasture. 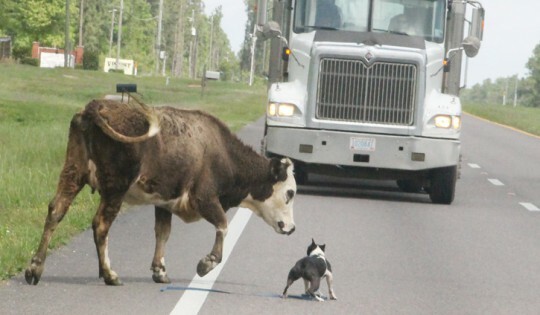 Pictured top: An 18-wheeler driver brakes to avoid hitting a dog and cow in southbound Highway 29 in Molino late Friday morning. 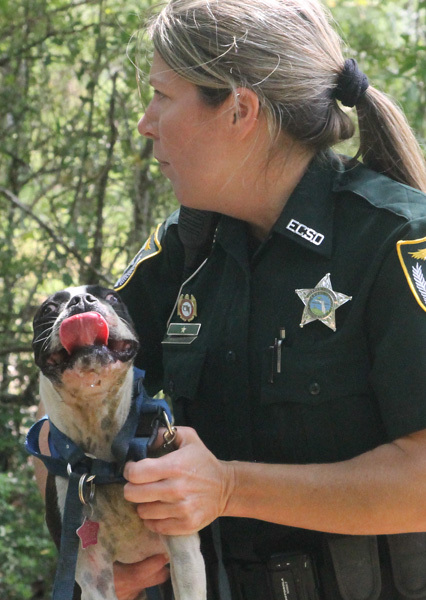 Pictured inset: Deputy Melissa Sterling took custody of th dog. Pictured below: A woman who became overheated while chasing the dog and cow around Highway 29 and a wooded area is helped to an ambulance for evaluation. NorthEscambia.com photos, click to enlarge.